Solidarity. The NGO Dibujos por Sonrisas presents the book ‘Diferente’, a joint work by 140 illustrators to raise money for refugee camps. 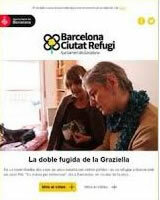 Do you want to receive the Barcelona, refuge city bulletin? Liudmyla is a refugee and a volunteer English teacher at the Escola d’Adults La Verneda, where she learnt Spanish. She fled Ukraine and is waiting for the state to resolve her asylum request. The service puts families which are temporarily unable to look after young children in touch with nearby childcare volunteers.